Interior design project for a unique tower apartment in Cornwall. I believe that interiors should reflect a property’s architectural design and location. I was delighted to be asked for my design input on this Grade II listed castle apartment, as I saw so much scope for the design scheme. The client brief was to create an opulent, luxurious living space by the sea. The result, is an interior design scheme which channels both the castle’s Georgian features as well as the property’s outlook. Built in 1775 as a country house, Acton Castle offers commanding views over Mount’s Bay. The now Grade II listed building, was created by John Stackhouse, an enthusiastic marine biologist. Stackhouse wanted a gentleman’s retreat where he could carry out his botany. The scientist commissioned architect John Wood the Younger, who at the time, recently completed designs for the world famous Royal Crescent in Bath. For the apartment, the client wanted to create a classic space with a contemporary twist for modern family living. 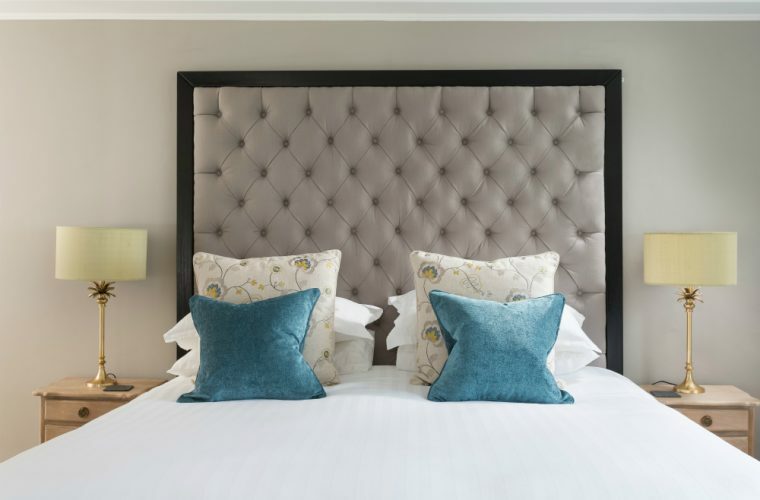 The client invested in plush headboards and buttoned leather chesterfield sofas for design opulence. In the main living space area, I used bookcase wallpaper to enhance the period of the building. We sourced period style furniture on eBay and up-cycled using black chalk paint for authenticity. The client opted for parquet wood flooring, which replaced the existing carpet. Wood flooring helps create warmth and brings texture to any space. I sourced fabric for the blinds online, and worked with a local seamstress who completed the make up. By working in this manner, I helped reduce design costs. 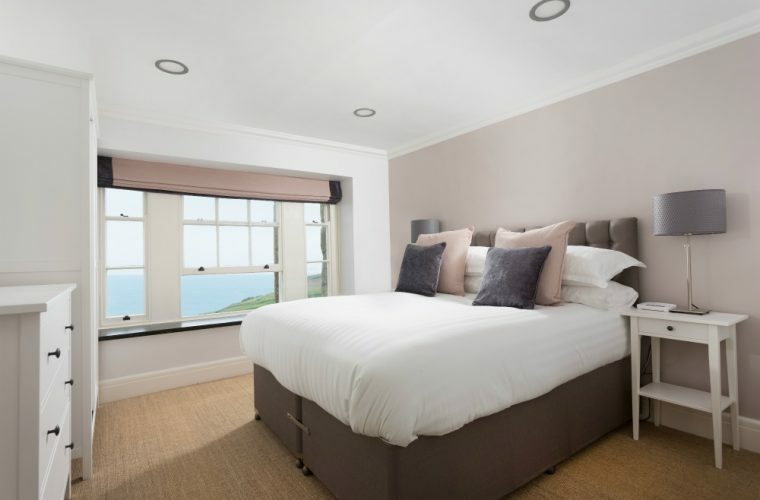 Working within budget, the apartment offers a place where the family can relax and enjoy holidays by the sea in Cornwall. 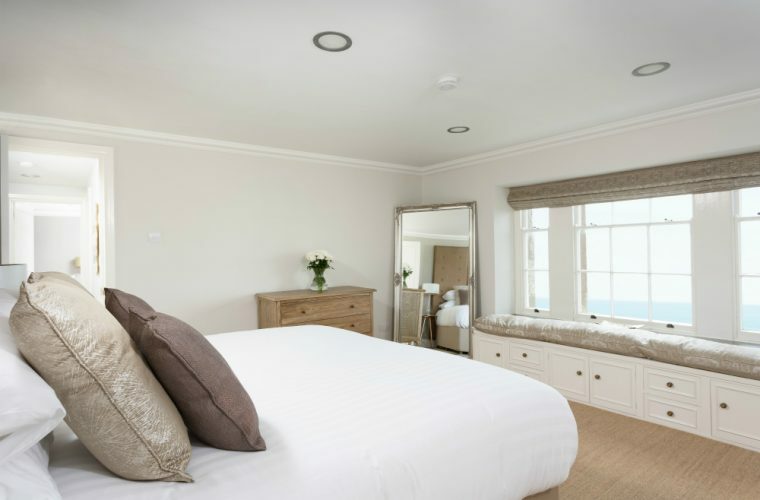 Book a stay at this luxury coastal apartment through Beach Retreats. 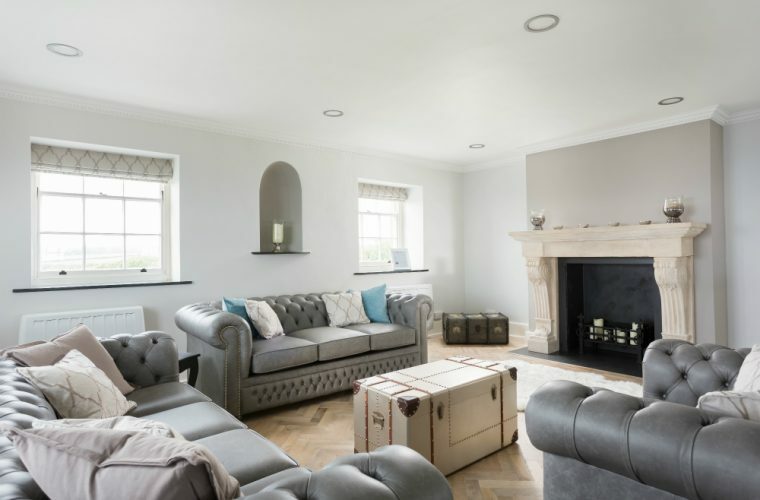 Read Tracey’s blog for interior decorating tips and advice.